Las Palmas on Gran Canaria in Spain is located about 20 km from the international airport. The distance from the airport to the city can be covered in about 20 minutes on the motorway. Gran Canaria can also be reached by sea as it is an island. At the port of Puerto de la Luz, there are not only various connecting routes to the other islands of the Canary Islands, but also to Cadiz. The port is also the starting point for various cruises between October and June of each year. Strolling through the streets of Las Palmas, you will feel like you're in the past. Here you will learn something about the history of this city. Visit the Chapel of San Antonio Abad and the Plaza Santa Ana, where you can also see the Town Hall. These buildings are only a fraction of what has left its mark on Gran Canaria for more than five centuries. With a rental car you can explore the surroundings of Las Palmas cheaply, quickly and comfortably. Las Palmas airport in Gran Canaria has the code LPA and is operated by AENA. The military Telde Air Base is also located in the immediate vicinity of the airport. Both runways are more than 3,000 meters long. However, the airport is not located directly in the city, but halfway between the holiday resorts of Playa de Ingles, San Augustin and Maspalomas and Gran Canaria. By car, which you picked up beforehand at the pick-up station of the car rental company, you drive about 25 minutes to the centre of Las Palmas. Depending on the location, the journey to the various holiday resorts can take a little longer. Of course, there are also catering facilities at the airport. You are in all zones. The biggest offer is in Zone A. But also in Zone B and C there are different places where you can get a snack. Both Burger King and restaurants with typical local dishes are available at LPA Airport. Restaurant Sbarro offers hot meals. Money matters can be handled locally at the Caja Canaria Bank. It is open on weekdays from 8 am to 134 pm. On Fridays it is also open from 5.30 to 7.30 pm. You can exchange money at Quick Change. The bank and the exchange office are located in Zone A. There are also various ATMs in Zone A, which are also located in Zone C. The LPA airport also offers communication facilities located throughout the terminal area. Card and coin-operated phones can be used at any time. A post office is also available. Various shops offer their services on the grounds of Gran Canaria Airport. Already in the check-in area there are five shops offering something for different occasions. Food, tobacco, souvenirs or perfume and cosmetics can be purchased. The duty-free shops also offer magazines, magazines, spirits and other goods at tax-free prices. A flower shop and a pharmacy also offer their services. The eastern location of the two airports in Las Palmas was explicitly chosen because of the good meteorological conditions. This makes it possible to maintain runway operations at both airports almost without interruption. The special environment and the diverse nature at the airports is also a special concept, as both airports in Las Palmas are managed in a resource-saving and environmentally friendly way. At LPA Airport in Gran Canaria, a total of five service providers handle passengers' luggage. Baggage will be handled in Zone A, C and B as well as provided for pick-up after guests have landed at the two airports in Spain. Cheap car hire and pick up at the pick-up station. If you want to rent a car at a low price, you can choose from a wide range of cars at LPA airport. Rental cars are available for you in the form of small cars, limousines and SUVs. You can then pick up your rental car at the pick-up point belonging to the car rental company. There are several companies that offer their services as car rental companies. Hertz, Europcar, Avis, Goldcar and Cicar have branches at the airport. Car rental companies are located in the arrivals hall of Terminal A with their counters. As soon as you leave the premises with the baggage carousels, turn right, again around the corner, past the shopping center. If you want to go from Terminals B and C to the car rental service to rent a car cheaply or to pick up the reserved rental car, turn left to Terminal A. The car hire counters are available at the entrance, which connects the two terminals. As soon as you leave Terminal A via the main exit, the way leads to the car parks located directly at Las Palmas airport. Your car rental company will inform you where the reserved car is located. At the car hire desk you can find out where to find the pick-up point where you can pick up your rental car at Las Palmas airport in Gran Canaria, Spain. Ask your car rental company where to park the car when you return it. Rent a car for less and discover the surroundings of Las Palmas and Gran Canaria by car. Depending on the car hire company, the pick-up point for your rental car may be in a different location. Information on where the car is located at LPA Airport can be obtained from the car rental staff. Where is the nearest petrol station at LPA airport in Spain? You can not only rent a car at Las Palmas airport in Spain, but also refuel your car directly near the two airports. The CEPSA petrol station is located in the immediate vicinity of the site and is open 24 hours a day, so that you can refuel your rental car at low cost even at night. Because of the island location, the accessibility to Gran Canaria by car, which you can rent cheaply at the car rental in Las Palmas, is absolutely good. You can easily reach any desired place by car. The north-south highway is marked with CG-1 and is the main artery on Gran Canaria in Spain. In this way you can quickly reach all the places of interest. Las Palmas airport is conveniently located directly at the Autovia Gran Canaria. In addition, all destinations are well signposted. You have the possibility to reach many tourist attractions by rental car. What special traffic rules do you have to follow in Gran Canaria? In Spain, and therefore also in Las Palmas and throughout the island, the maximum speed on the motorway is limited to 120 km/h. On expressways you are allowed to drive at a maximum speed of 100 km/h, on country roads at a maximum speed of 90 km/h. The maximum speed in urban areas is 50 km/h. The alcohol limit in Spain is 0.5 promille. Buckles are also obligatory throughout the country. Violations will be fined. In Maspalomas and Palma there are several places of interest that you can easily reach by renting a car from a car rental company of your choice. In Maspalomas you can visit the Palmitos Park. It lies behind Maspalomas in the mountains and presents itself as a tropical park. They move under palm trees and walk past a beautiful fauna. There is also a dolphin show there. By rental car you will then return to your hotel in Las Palmas or another place on Gran Canaria. The Playa de Maspalomas is also worth seeing. There you can go for a walk on the approximately six-kilometre-long beach or lie down in the sun and relax. 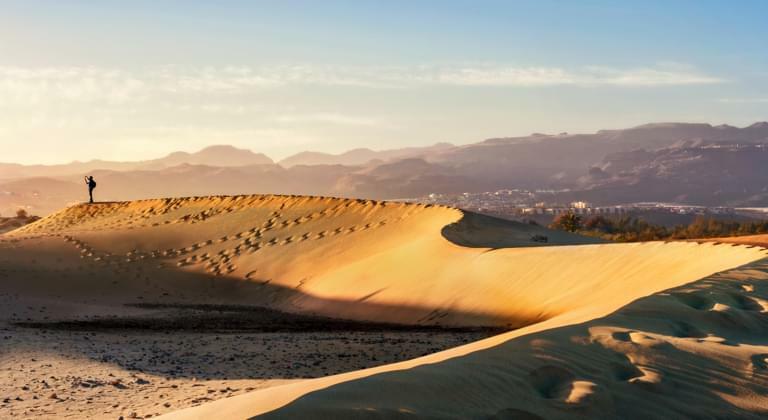 The Dunas de Maspalomas also invite you to take a walk before heading back to Las Palmas for a relaxing evening in your hotel or town. In Palma itself, there are also many places of interest and places worth visiting for you and your family. For example, you can rent a car to the old town of Veguta, which extends to the port of Palma. Would you like to rent a car at an affordable rate from your car hire company and pick it up at the LPA airport pick-up point to drive it to the Cudad Atla district of Palma? In Las Palmas, there are two different city centres located approximately four kilometres apart. They are of particular interest to tourists, as not only the two districts of Vegueta and Triana are worth visiting, but also the Santa Catalina district, which is located between the port of Las Palmas and Canteras beach. Book a cheap rental car at the best prices with us and discover Gran Canaria in a comfortable, affordable and comfortable way. Rent a car that you can pick up at the pick-up point at Las Palmas airport.